Contact SWEET! Enterprise Edition blends e-mail and web chat with voice calls into your contact center. Each channel is treated as a customer interaction, no matter how it arrives and given the appropriate priority you set. Non voice calls can be dealt with as business needs determine, ensuring they are allocated to agents based on parameters you set, perhaps when agents are ‘idle.’ As these new channels are introduced to your business, you will see a dramatic increase in productivity. Agents can be on the phone, while dealing with a web chat request, and replying to e-mail! Interfaces with Avaya IP Office via CTI Link - Requires CTI (computer telephony integration) license on IP Office system. Live Views - Provides real time information about your agents. Comprehensive live views can be set to alert you real time of any issues that need attention such as calls in queue, abandoned calls and more. Can add additional agents for Live Views on a per agent basis (sold separately). Historical Reports - Includes historical reports for all extensions at a single site. Comprehensive reports can be scheduled to be automatically emailed. Use historical reports to analyze patterns and trends in your calling. Use this information to learn about peak calling times, extension durations and more. Avaya DevConnect Certification - A fully tested solution for the Avaya IP Office system. Increase Productivity - Track agent activity to ensure they are operating at maximum efficiency. Use reports to better manage staffingg to meet your customer’s needs. 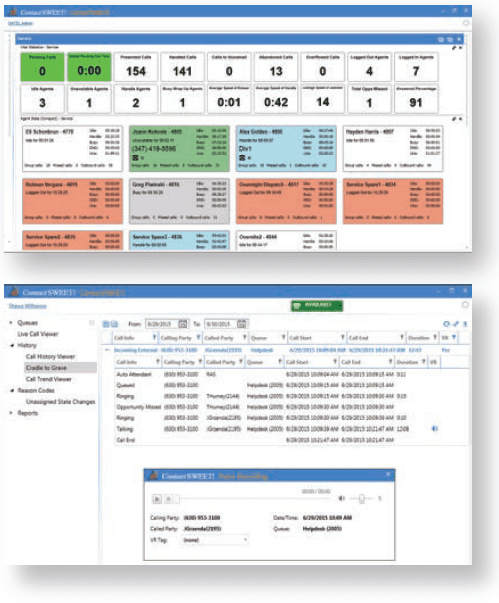 Reduce Costs - Receive automatic alerts for misuse and excessive call durations. Analyze historical reports to better manage costs. Identify Trends - Text and graphical reports provide comprehensive views into all calling activity - inbound, outbound and internal. Use this information to be proactive in resolving issues and optimizing business operations. Drill-Down Capabilities - Get high-level metrics or granular details on all of your extensions, agents and hunt groups and reduce the need for dozens of separate reports. Service Levels - Evaluate individual and group performance with service level reporting. Keep your customer service standards high by setting and maintaining company-wide goals.